Sounds like a tall order, right? 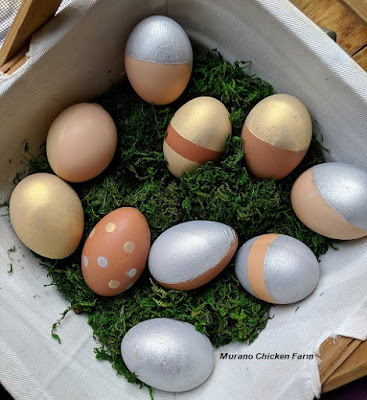 I needed a food safe dye that was both metallic and opaque enough to cover brown eggs. I've watched enough episodes of Cake Boss to know this type of thing exists though so I just had to find it. Luckily the first company I checked with makes just the thing I needed! The Wilton company makes shimmering food color spray in gold and silver. Party City carries the whole line of colors so I was able to pick them up right away. Click these links to order the gold and silver on Amazon if you don't have a PC store by you! All I needed was some painters tape and a safe place to spray and I was ready to color some eggs! I used a large cardboard box as my spray box although this product is water soluble and wipes up super easy, so I later realized the box really wasn't necessary. 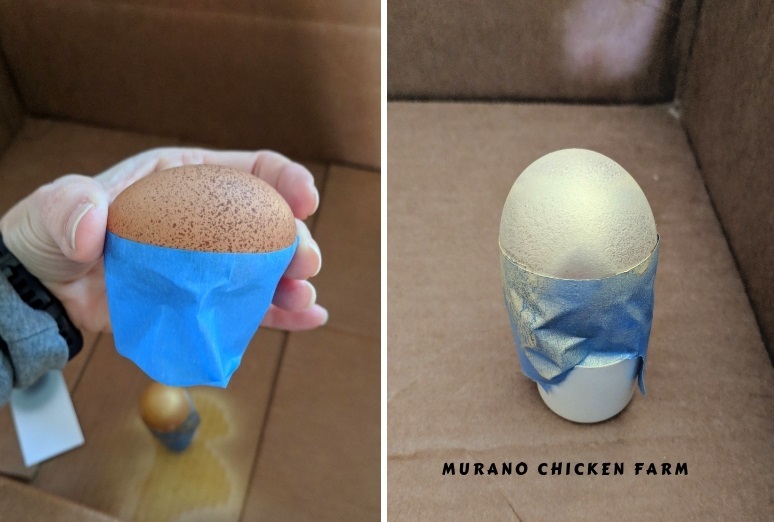 Use the painters tape to tape off the parts of the egg you want to remain brown and spray the rest of the egg. It's that easy. You can play with your designs a lot using this method. Cover the top or bottom half the egg or place the tape on an angle. Cut strips or shapes from the tape. You can even layer colors. Use painters tape not paper tape like washi. Washi sticks to the egg too much. Painters tape peels off smooth. Other tapes can remove bits of shell when peeling it off. Using your fingernail, make sure every edge of the painters tape is pressed against the egg firmly. If it's not flush with the egg, the paint will roll down under any gaps in the tape. Spray several thin coats rather than 1 heavy coat. Allow a few minutes to dry in between coats. Wait till the paint is dry to peel off the tape. Drips and over spray can be cleaned up with water. Use a wet Q-tip to clean up edges. To make dots or shapes punch a hole in a note card with a hole punch. Hold the card against the egg and spray with a quick burst. 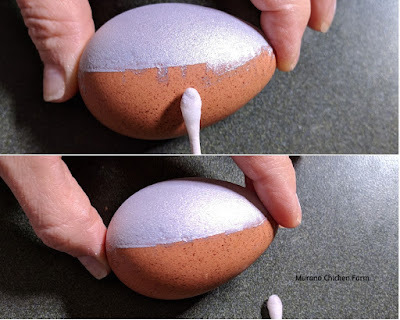 Allow to dry before doing another spot on the same egg. 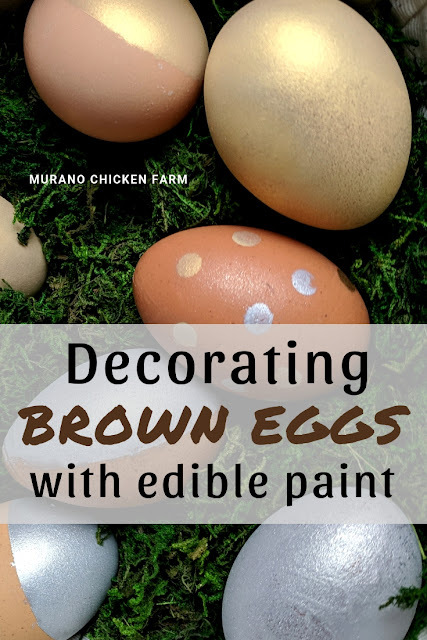 You can color about a dozen eggs with each can, more if you're doing designs and leaving some parts of the egg natural. I do not recommend the black as it never dried. The color mist comes in just about every color of the rainbow but only the metallic ones dried down to a dry coating. The colors stay kind of wet even after 24 hours. 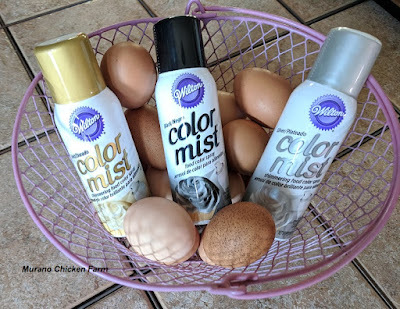 I tried them on fresh eggs and boiled eggs just as an experiment and the color sprays stay tacky on both. Keep this in mind of you want to try one of the other colors. The pearl might work, though I did not try that one. If you decide to give it a try let me know how it works out! Have fun coloring your eggs! Want more ideas for using feathers and eggshells? Check out my other chicken craft tutorials. As per usual, your advice came right on time. We had just discussed the illogic of buying white eggs for Easter coloring when we were getting more than enough brown eggs daily. Your info will definitely be used along with the whipped cream and food coloring marbling method. Thank you so much for sharing. I'm so glad that I could help out with your egg decorating! Let me know how they turned out!